There are a number of parks and open spaces in the borough which host fitness equipment. We have a number of sites across the borough where fitness equipment has been installed. A special Olympic themed outdoor fitness facility called The Adizone has been installed at Old Deer Park, Richmond. It is sponsored by Adidas and will further increase the opportunities for residents to lead an active and healthy lifestyle. The Adidas reputation will engage young people and provide a place for them to be a part of the Olympic movement in Richmond. 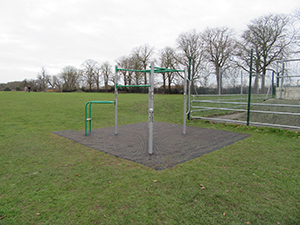 Ham Village Green, Hatherop Park, Kneller Gardens and Palewell Common & Fields also have had fitness equipment installed. They include a mixture of static and moving items which are suitable for all users. At Murray Park, we recently installed a number of items around the entire park in a 'trim tail' fashion. This installation has been accompanied with thermographic markers on the main pathways. This is to encourage users to jog, run, sprint & walk at 100m intervals. 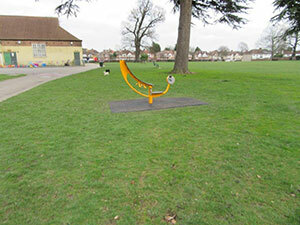 At Kings Field, Hampton Wick, a Multi-Purpose Fitness Frame has also been installed. The equipment at the above sites has been fitted with a grass-matting safety surface. This will also help to sustain the surrounding grassed areas. Please read these instructions before using the equipment. If you are in any doubt about your health or level of physical fitness, please consult a doctor or fitness professional before using this equipment. Read the instructions on each piece of equipment first. Do not use any equipment if it appears damaged, or is malfunctioning. Please report this to us on 020 8891 1411 or email parks@richmond.gov.uk. Aim to do at least 20 minutes of medium to high intensity exercise overall, spending approximately two minutes on each piece of equipment. Begin your exercise routine with a warm up session. Start slowly and built up intensity gradually. Stand clear of all equipment when in use by someone else. Be courteous, allow others to use the equipment as soon as you have finished your session. Stop if you feel faint or dizzy. Do not use under the influence of drugs or alcohol. After your session allow 5-10 minutes to stretch off and cool down. Stretch each muscle group for 15-20 seconds. Users of this equipment do so at their own risk. We do not accept any liability for loss or injury caused by the use of this equipment. N.B. Please note that it is not advised for under 14 year olds to use the equipment.